Helping Hands Daycare is owned and run by husband and wife partnership, Norman and Deborah Murton. Daycare Centre which include: supporting hardworking parents, ensuring that the children in their care experience a nurturing environment and getting families actively involved in their early years of development. The main goal of this website, as outlined by the client, was to suitably represent the positive attitudes, setting and work ethics of Helping Hands Daycare itself. The client wanted an open plan styled website which, when combined with the scenery in the Header, imitates the healthy lifestyle that Helping Hands Daycare promotes. This client also opted for Bespoke Page Dressing on the home page in the form of a jigsaw piece effect. Similarly, the logo, symbolizing creativity and support, uses the very literal image of ‘Helping Hands’ itself in its design. Both these features give this website a playful yet artistic feel. 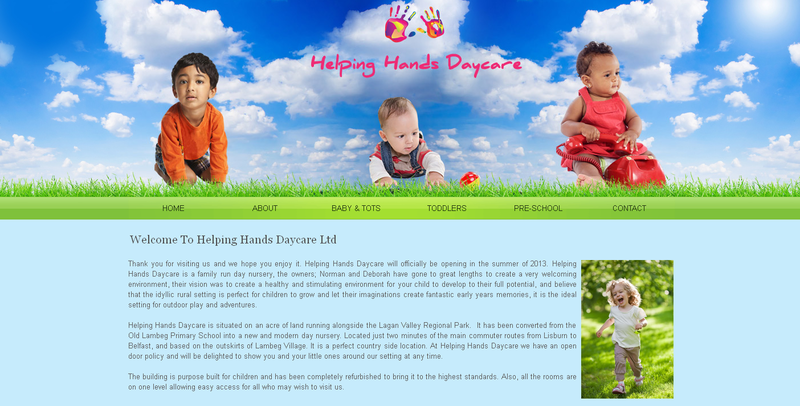 Potential customers of Helping Hands Daycare will feel a sense of wellbeing and support when they visit this site. Logo design and home page layout is crucial to any business trying to make their way on the web and goes a long way to encourage visitors to navigate further around a website. We recently blogged about this very topic and also discussed a total of 15 ways to encourage visitors around a website. "We absolutely loved the finished product, and all staff at toolkit were very professional and helped us through each stage of the design. Can recommend this company to anyone looking for a new web-site"
Before giving a 3.5 star rating. A special mention on this websites build and design must also goes to one of our designers, Ben Moss, who worked tirelessly with the Project Manager for the build, Lanara Mitchell from start to finish.